Often known in other guilds as “Bees”, Tributaries are small groups that meet regularly for members to share their love of quilting. Meetings are very casual and always open to visitors and/or new members. All offer plenty of free advice. Sometimes of it is even about quilting! Following is a quick summary of the current Tributaries. Please note: There is no limit to the number of tributaries in Red River Quilters. If you would like to start a new group please let any Board Member know so we can help you get started. The more the merrier! Pack a lunch and prepare to laugh! The Haughton Quilters usually work on individual projects (both by hand and machine) but sometimes tackle a common pattern. Twice a year the group organizes a 4-day overnight quilting retreat. There are also 3-day “sew-ins” twice a year at the church. This group meets monthly to work on a year-long quilt project. 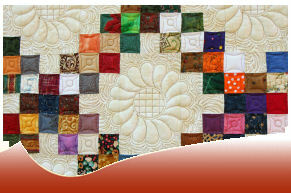 Quilts may be completed with monthly “steps” or at each individual’s own pace. Members meet each month to encourage & admire each other’s progress in Show & Tell. These ladies spend their Thursdays sharing quilting, laughs and dessert! Everyone brings their own works-in-progress to stitch (both by hand and machine) although there’s often a contingent working on a common project. Bring your lunch and look forward to homemade dessert in a pieceful setting. Like a box of chocolates, you never know what you are going to get! The interests of this group include quilting, knitting, beading and garment making. Members enjoy a hostess-prepared lunch as they share and discuss their latest projects (both for hurrahs and helpful hints). Note: Please contact Mary if you’d like to attend as the meeting location changes each month. Join the chatter around the table! Everyone brings their individual projects to work on (both by hand and machine) as well as a lunch to enjoy in each other’s company. Support and encouragement is sweetened with homemade dessert!